They live along the Amazon river, close to the water. They fish and eat. Since they have a lot of time, they spend it talking to each other. They have a simple language syntax – 8 consonants and 3 vowels for men and 7 consonants and 3 vowels for women. The amazing thing is that they can talk, whistle or sing their language (three different equivalent forms). Rhythm and accent patterns convey meaning. They don’t have recursion in their language. For example, they can’t say “Fred said that Ram thought that Tom meant”. But the possess an astounding knowledge of nature. They know every tree, animal, plant in their region and know about each one of them in detail. Daniel Everett talks about his 30 year study of Pirahã, an indigenous language of the isolated Pirahã people of Amazonas. A link to this podcast. and a link to the Wikipedia entry to Pirahã. The mark of an effective tweet, like the mark of any effective pitch, is that it engages recipients and encourages them to take the conversation further – by responding, clicking a link, or sharing the tweet with others. Rhymes boost what linguists and cognitive scientists call “processing fluency,” the ease with our minds slice, dice, and make sense of stimuli. Rhymes taste great and go down easily and we equate that smoothness with accuracy. In this way, rhyme can enhance reason. 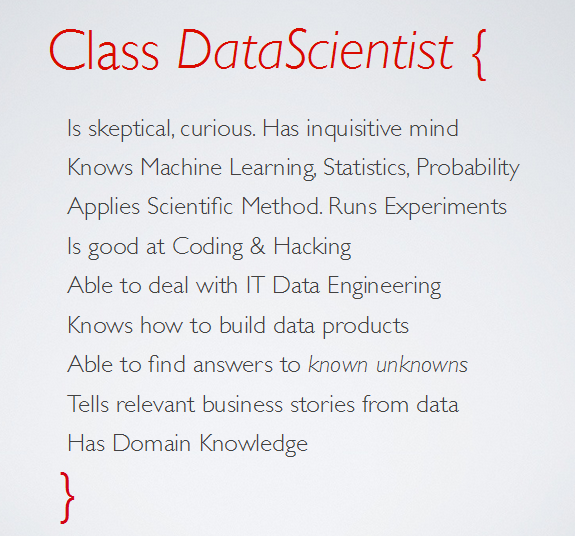 However, if you liked this, you will love this presentation – What is a Data Scientist? Interested in seeing if online advertising will work for your business? Start with $500 and see if you can get a return on it. It’s not too hard to find $100 Google AdWords credits for first time advertisers so you’re a fifth of the way there! Can trade shows help boost your sales? Partner up with someone who is already going and see if you can get a part of their booth instead of dropping thousands of dollars on your own. See if you’re getting a response from people and then you can make an educated decision on future trade shows. The real answer is “it depends”. But Evan leads you through a way of thinking through this problem. You need to spend some effort and money in going to trade shows where your potential users show up. We have done it with a lot of success. In these conferences, you don’t really sell. You observe. Talk to people, network and validate some of your hypotheses. You need to use lot of free inbound marketing techniques – Blogging, Tweeting, Leveraging LinkedIn, Facebook, Creating whitepapers, screencasts, conducting webinars. Try them all. As Evan recommends, measure which one works for your product and industry. This whitepaper from Intel is a fascinating read. Though there is still debate on the specific definition, knowledge work is generally seen as work that most leverages human intellect, creativity, and analytic skills. Trends are already indicating that a growing number of jobs will require a significantly more complex set of interdisciplinary skills such as problem solving, judgment, listening, data analysis, relationship building, collaborating and communicating with multinational co-workers. Knowledge jobs are growing two and a half times faster than transactional jobs which involve fewer conceptual duties, and knowledge workers represent the fastest growing talent pool in most organizations. Anything that can be automated may be automated sooner or later. Automation is one of the biggest job killers. The good part is that humans hopefully need to do less boring and repetitive work, just to make a living. The bad part is that many people who depend on these types of jobs for livelihood need to figure out how to make a living. Another assumption worth making is that the benefits of automation are not necessarily going to be uniformly distributed (a kind of Benefit Asymmetry). Every technology development – Big Data, Sensor Evolution, Robotics etc. will start chipping away at jobs. Some may even impact knowledge workers. Our current educational system is not well equipped to deal with changes. That is another disruption looming in the horizon and it will affect over 60 million teachers in some way or other. The question that keeps bugging me is that how can we help prepare for the future, especially when we don’t know what it is going to be. Education in the early part of the twentieth century tended to focus on the acquisition of basic skills and content knowledge, like reading, writing, calculation, history or science. Many experts believe that success in the twenty-first century depends on education that treats higher order skills, like the ability to think, solve complex problems or interact critically through language and media. Institute of Play makes a compelling case for games in education to build these higher order skills. It is an experiment worth trying in schools and colleges. When an aspiring entrepreneur asks me whether I have a few minutes to talk about their idea, I always say ‘yes’. I like to know what kind of problems people are working on and how we (as a community) can help. What follows is kind of interesting. Sometimes, the explanation is crisp and coherent. They are working on product or service in a niche emerging market. They have done some initial customer validation. They talk about the problem space and what other solutions exist. They even have a prototype and got some initial feedback. They are thinking through some of the next steps. They want to know what I think. I ask a few general questions (mostly about their assumptions) just to make sure that I really understand what they are doing. I either know this space or I don’t. I make some suggestions on how they can validate their assumptions. The dialog lasts about 10 minutes. If I like the idea and get a good feel about the entrepreneur or the team, I ask them to send me an email, so that I can help or connect them with someone who can. Some times just when I am about to leave, they ask me whether I have one more minute. And I hear the dreaded words “I have this other idea”. All my earlier interest evaporates at that point. To steal a phrase from my friend J.K. Iyer, too many of us suffer from “idea myopia”. I think there is a cure for “idea myopia” or its cousin “product myopia”. We think too much about ourselves, our ideas, our products. I am not discouraging creative thinking. I am just saying that it pays to do some early research and validation. Here are a few steps you can take that will help immensely. Write down all your ideas and pick one or two. Do some research (to get a sense of the marketplace) and select one idea to explore further. Write down a list of assumptions you are making about the customers, marketplace. Have a few conversations with potential customers and validate your assumptions. Some times you need a mockup or prototype to explain your idea. Some times you can just paint a few scenarios relevant to your customer. Anything that increases the customer’s understanding will help. Based on several such conversations, go back and refine your assumption and the idea itself, if needed. At the end of this process you will either discard the idea or refine it. Both are good and will save you a lot of time and expense when you move to the next stage. 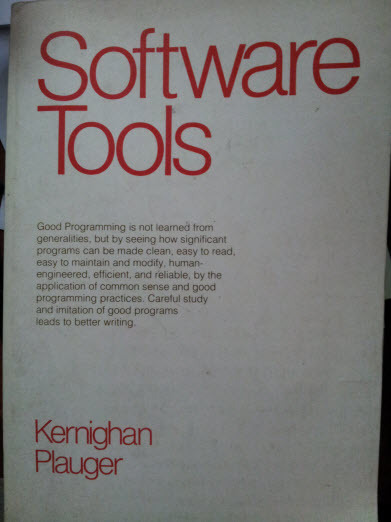 This is the cover matter on one of my favorite books, ever – Software Tools. Good programming is not learned from generalities., but by seeing how significant programs can be made clean, easy to read, easy to maintain and modify, human-engineered, efficient, and reliable, by the application of commonsense and good programming practices. Careful study and imitation of good programs leads to better writing. This book was first published in 1976. I read it when I started my second company in 1983. I lost my original copy and recently bought a used book. I still enjoy reading bits of it once in a while. 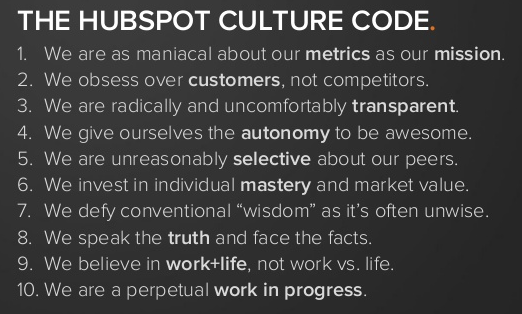 Hubspot is an amazing organization – a few I really admire and learn from. Here is one more thing to learn from them – how to build a culture.